The aim of the move is to boost jewelry trade and exchanges between China and Thailand "to establish a modern-day 'silk road' under the name of the China-Thailand Gemstone Traders Association (CTGA). "Complementing each other’s advantages, this confederation will build a bridge of exchange, communication and trade cooperation in the gems and jade market of both countries," the TGJTA said in a statement. The Memorandum of Understand (MoU) was signed on May 9 by Wang Wan Fong, President of the Shanghai Gems & Jade Exchange, and Suttipong Damrongsakul, President of the TGJTA. The TGJTA delegation visited the Shanghai Gems & Jade Exchange as well as bringing 16 exhibitors from Thailand to showcase at the Jewelry Shanghai 2017 tradeshow. “We believe that strong cooperation across the region is a key tool to drive forward the current industry’s challenge. China and Thailand has been a strong alliance for each other and this would make the region as the center of future global jewelry market” said Suttipong. The TGJTA will be holding the inaugural Thailand Gems & Jewelry Fair from June 15 to 18, at IMPACT Challenger 2 in Bangkok. 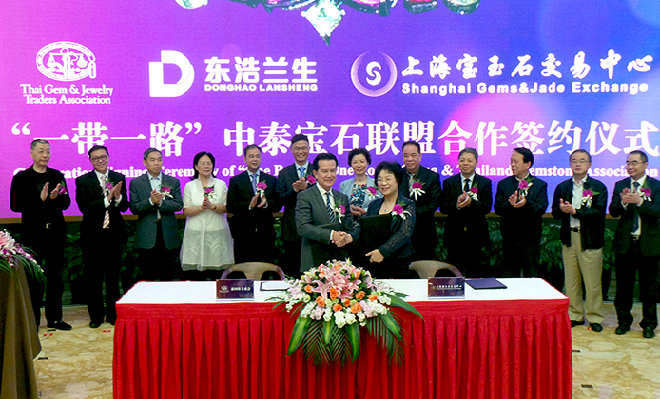 Suttipong Damrongsakul (left), President of the TGJTA China-Thailand Gemstone Traders Association at the MoU signing ceremony with Wang Wan Fong, President of the Shanghai Gems & Jade Exchange.